Add this caramel cream pie to your must try list! 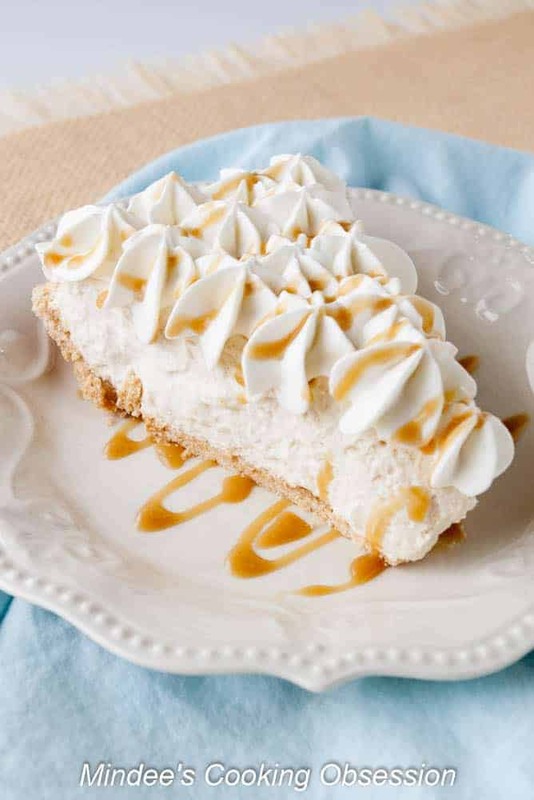 You’ll love this creamy caramel pie topped with whipped cream and drizzled with additional caramel! Doesn’t that slice of caramel cream pie look YUMMY! I wanted a new pie to add to my Thanksgiving pie list. 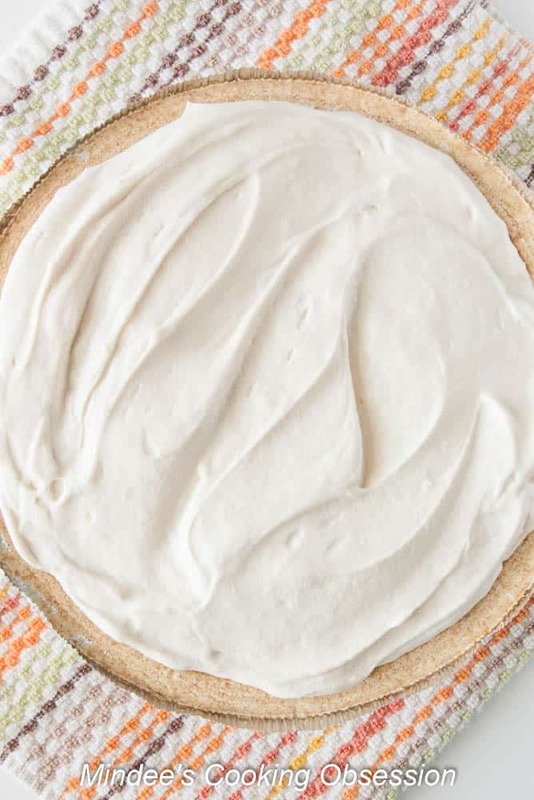 My husband is more partial to cream pies than fruit pies and loves caramel so I set out to create a caramel cream pie. This pie is really easy to make and oh so delicious! So click on over to my website and print yourself a copy of the recipe! If you need a couple more pie ideas this holiday season then check out my Irresistible Chocolate Mousse Pie and my Pumpkin Cream Pie! Both are just as easy and taste amazing! I cheated a little and just bought a pre-made Nilla Wafer crust. Not only is it easier, but I’m usually out of pie plates by the time I get to making the cream pies for Thanksgiving. So step one, buy a Nilla Wafer crust. The caramel sauce for this pie is made from scratch, but it is incredibly easy. Heat the butter, brown sugar, salt and water over medium heat until boiling. Boil for 5 minutes. Remove from the heat and whisk in the vanilla and evaporated milk. Measure out 1/4 cup of the hot caramel, add an additional tablespoon of evaporated milk to it. Put this little bit of caramel in the fridge to save to drizzle over the finished caramel cream pie, Pour the rest of the hot caramel in a medium mixing bowl and place over a larger bowl of ice as pictured above. You can just let the caramel cool on it’s own, but cooling it over ice only takes 3 or 4 minutes. 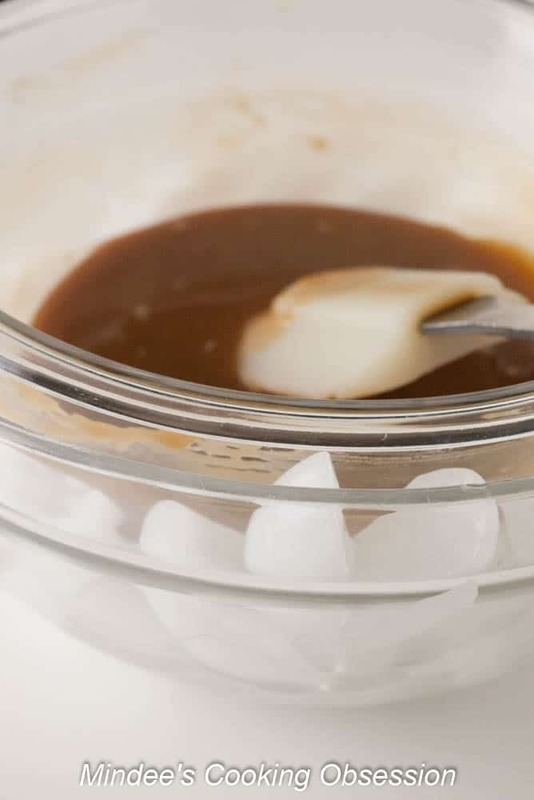 Once the caramel is cool remove the bowl from over the ice, dry the bottom of the bowl and beat the softened cream cheese into the caramel sauce. Beat it until it is completely smooth. In another bowl beat the whipping cream until it starts to thicken up. Add the sifted powdered sugar and continue to beat until stiff peaks form. 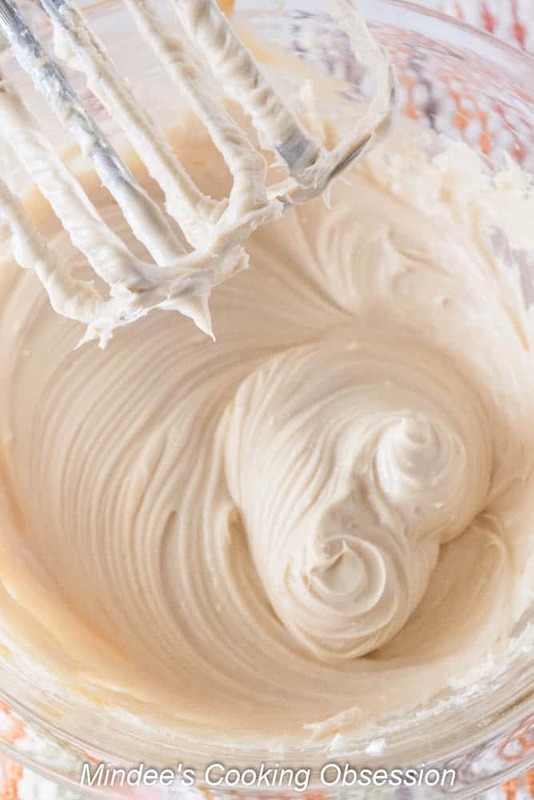 Fold in 1/3 of the whipped cream in the cream cheese caramel mixture. Be sure to fold, not stir. Stirring will deflate the whipped cream. Fold in the remaining whipped cream in two additions. Smooth the caramel cream pie filling into the Nilla Wafer crust. Refrigerate for at least 4 hours or overnight. Then whip another cup of whipping cream as directed in the recipe and until stiff peaks form. Pipe over the top of the chilled caramel cream pie. Drizzle the pie with the reserved 1/4 cup of caramel sauce. Add this caramel cream pie to your must try list! 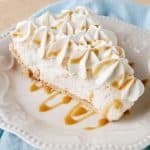 You’ll love this creamy caramel pie topped with whipped cream and drizzled with additional caramel! Makes one 8 inch pie. Over medium high heat, bring the butter, brown sugar, water and salt to a boil. Boil for 5 minutes. Remove from heat and whisk in 1/4 Cup of the evaporated milk and the vanilla. Pour 1/4 cup of the hot caramel into a container and whisk the remaining 1 Tbs. of evaporated milk into it. Cover and store in the fridge for drizzling over the top of the finished pie. Pour the rest of the hot caramel into a medium mixing bowl and set the medium bowl over a large bowl of ice to cool the caramel quickly. If using this method the caramel will be cool in 3-4 minutes. Stir the caramel here and there while it cools. Once cool, remove the medium bowl from over the bowl of ice and dry the bottom of the bowl. Beat the softened cream cheese into the caramel sauce. Beat until completely smooth. In a separate bowl, beat the 1 cup of whipping cream until it begins to thicken. Add the sifted 2 Tbs. of powdered sugar and continue to beat until stiff peaks form. 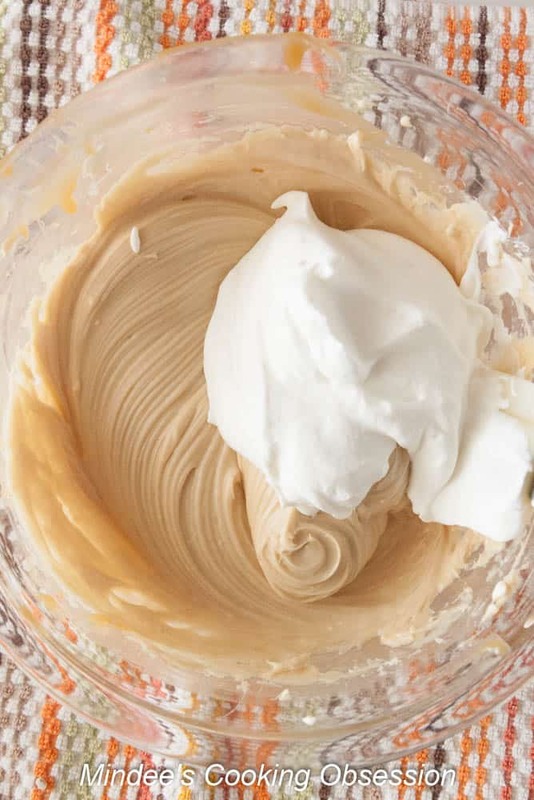 Fold 1/3 of the whipped cream into the caramel cream cheese. Be sure to fold, not stir. Fold in the other 2/3s of the whipped cream in two additions. Spread the caramel cream pie filling into the Nilla Wafer crust and chill for at least 4 hours or overnight. After the chilling time, beat 1 cup whipping cream until it begins to thicken. Add the sifted 1/4 cup of powder sugar and the vanilla. Continue to beat until stiff peaks form. Pipe over the top of the caramel cream pie. Drizzle the reserved caramel sauce over the top of the pie. Enjoy! Store leftovers in the fridge. 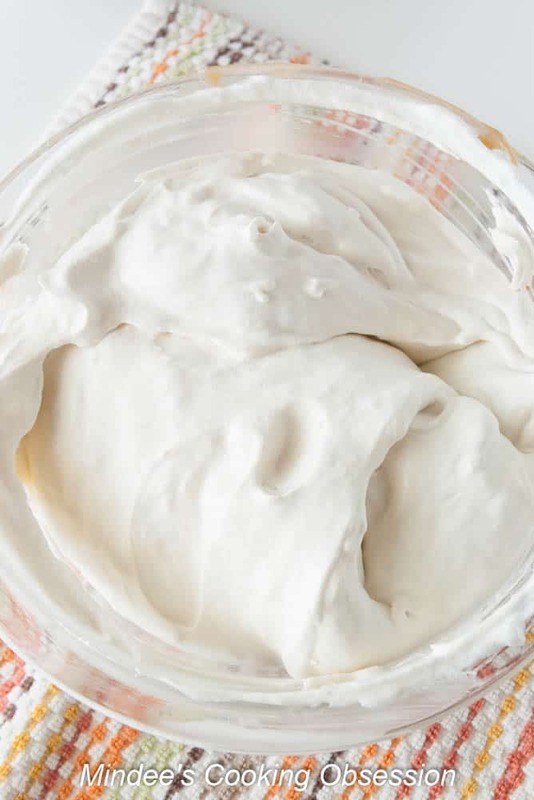 I used regular whipping cream in this recipe instead of heavy whipping cream. I felt like the heavy cream made this pie far to dense and rich. However, if you want to use heavy cream it will work, too. And don’t forget to follow me on Facebook, Pinterest and Instagram!